I had trouble getting into Illusionarium. It went from slow to slower, despite what should have been really arresting developments. Still, after a long break, I came back to it and found the second half much more enjoyable. This eARC was provided through Edelweiss for review. Some things may have changed in the final version. What if the world holds more dangers—and more wonders—than we have ever known? And what if there is more than one world? From Heather Dixon, author of the acclaimed Entwined, comes a brilliantly conceived adventure that sweeps us from the inner workings of our souls to the far reaches of our imaginations. Jonathan is perfectly ordinary. But then—as every good adventure begins—the king swoops into port, and Jonathan and his father are enlisted to find the cure to a deadly plague. Jonathan discovers that he's a prodigy at working with a new chemical called fantillium, which creates shared hallucinations—or illusions. And just like that, Jonathan is knocked off his path. 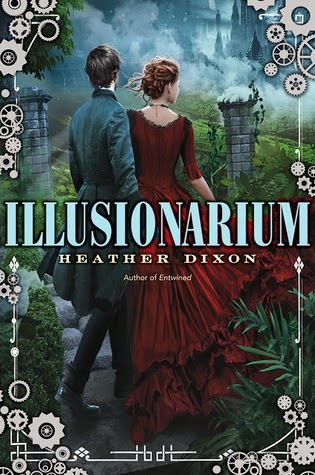 Through richly developed parallel worlds, vivid action, a healthy dose of humor, and gorgeous writing, Heather Dixon spins a story that calls to mind The Night Circus and Pixar movies, but is wholly its own. I have mixed feelings about Illusionarium. I love the ideas (airships, steampunk, parallel worlds, science mixed with magical illusion drug), but the execution has some serious issues. My problems with the story have one main root: Jonathan, the protagonist. He's an okay MC, but the pacing/tension/narrative drags when he's by himself. He tends to react rather than act, and he gets too wrapped up in his thoughts. You need his opinionated sister or someone with him to keep the story moving and, more importantly, keep both the fast and slow spots interesting. That said, I was bored for the first 20% of the book. I wasn't invested in any of the life and death matters arising--partly because the narration style kept me at a distance, but mostly because Jonathan on his own is boring. I was much more interested once we entered the dangerous parallel world. There's still a lot of page time in Jonathan's head, which is still boring. However, once Jonathan finds co-conspirators/friends (who have more compelling personalities and inspire more interest and attachment), the story improves dramatically. The pacing improves; the narration evens out, there's action, the danger feels real and you worry about all that's at stake. I don't want to give away too much, but, while I'm not a huge romance person, a certain burgeoning attraction between two headstrong, fun characters in the second half of the story gives you something to invest in if you haven't connected with Jonathan. Also (again, no spoilers), my single largest regret is that we don't see more of the stereotypical-British comic genius briefly displayed near the end of the book. I failed to connect with Jonathan and would have preferred a different MC. If you connect with him, you should have no problems loving this book. If you don't, stick it out through the first third and you'll find a magical, dangerous adventure with new characters you can root for. Hm, sounds like an interesting premise... what a shame it just wasn't done well. So, I DNFed this one because I couldn't' connect to the MC AT ALL. I wonder if I should have stuck in there? Oh well. I totally agree and felt that the execution was lacking. I did love the idea behind the story though. Wonderful review. Thank you! I went back to it because Dixon's writing style isn't bad, and I feel guilty DNF-ing any eARC's I can manage to get through. ^^; But in general, I'd be in your boat; if the characters don't grab me within the first chapter or two, I'm probably not continuing.